When a valuable Salvador Dali painting belonging to her grandmother’s friend is mysteriously replaced by a forgery, FBI Special Agent Serena Jones is called in to investigate. Serena hopes finding the thief will also mean finally measuring up to Nana’s expectations. But when the evidence points to members of the owner’s own household, it becomes increasingly clear that Serena won’t be winning any popularity contests. The Dali isn’t the only painting that’s fallen prey to the forgery-replacing thief, raising the specter of a sophisticated theft ring–one with links to dirty cops, an aspiring young artist, and the unsolved murder of Serena’s grandfather. With plenty of edge-of-your-seat moments, Another Day, Another Dali gives the plucky Serena Jones–and readers–a new high-stakes case to crack. I am so glad to have the title for your next book, “Another Day, Another Dali” to be released in October 2016. I recently won a copy of your first book the delightful Serena Jones Mystery series (from Goodreads) and am now anxious to continue the adventures of Serena Jones and the two main men in her life, Tanner and Nate. The short excerpt from “Another Day, Another Dali” left me wanting more! I will be submitting a review of “A Fool & His Monet” to Goodreads shortly. Reading, Mysteries, and Art are two are my own passions, so Serena’s career as an FBI Art Crime Team was the perfect mystery subject for me. And though I enjoy the Stephanie Plum books, I was really pleased the your characters and story were not as frivolous or superficial, had more substance, and yet were still laugh-out-load funny. Personally, I would like to see Serena end up with Tanner. He appealed to me more because of his maturity, gruffness and humor. In my mind, I picture him as somewhat like Sam Elliott, the actor, not just a pretty boy. SPOILER ALERT: Let’s give Nate a chance by having you develop and reveal more about his previous, now undercover profession, which Aunt Martha obviously is privy to. Just finished “A Fool and His Monet”. I enjoyed the characters, and Serena’s passion for restoring lost and stolen art. Thank you so much for taking the time to tell me, Kathy. I am so not happy. I checked out “A Fool and his Monet” from the library on Friday. I finished yesterday. 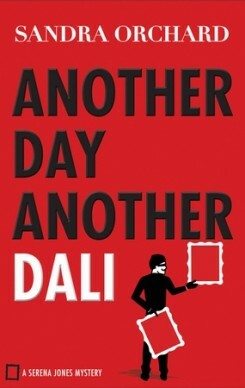 I then decided I needed to read “Another Day, Another Dali” and had downloaded that to my Kindly before lunch. I finished reading it this morning, less then 24 hrs later. (That might be a record for me – I didn’t even starve my family to do it either, lol.) BUT now I have to wait until the summer to read the next book!! I am so sad! I LOVE THIS SERIES!! Ah, thanks, Jodi. What a nice note to read before bed. I’m so happy you’re enjoying the series.